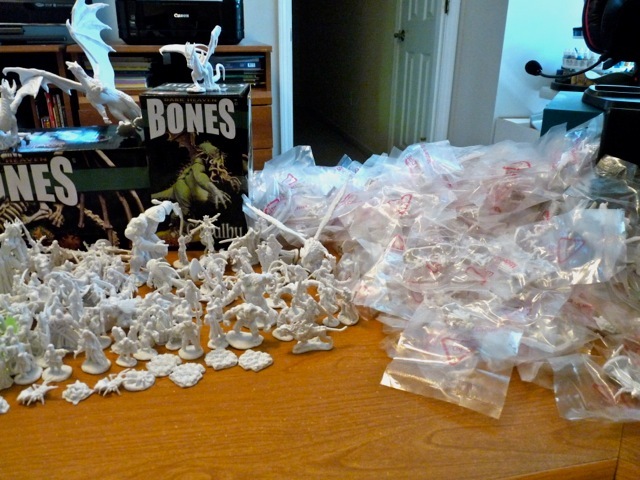 I had convinced myself that out of all 17,744 backers of the Reaper Bones Kickstarter, I’d get mine last. Well, miracle of miracles, I was not. I was close though. All of the local people and the majority of our Asheville Pathfinder Lodge had already gotten theirs… and last I checked it was down to 4500 left to go on the Reaper Webpage Kickstarter Tracker-thing, and then I got home this last Thursday and a huge box had been dropped off. With next to no recollection of what I had actually ordered, I was unprepared for what arrived. I got one figure case, a Cthulu, a Vampire-level, a Kaladrax, a tisket, a tasket, a barrel of bones in a basket. I got a passel of paints but realize that I’m going to need even more. Black primer? One bottle won’t cut it. One bottle of black anything won’t cut it. I’ve already put in another order for more. On the official Reaper forums there is some talk of missing pieces, but honestly… I wouldn’t even know it at this point. If I’m missing one or two figures, I still count myself lucky that I got in to this Kickstarter. Ten years ago I would have considered myself an above-average painter. Now? Quite a bit less than that. With the amount of lead, err… plastic at my disposal I think I’ll get back to near-professional levels. I certainly have enough to practice on. As weeks go by, I’ll be showing some in-progress and some finalized pieces. 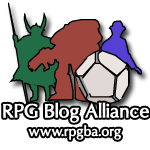 I have great plans for some of the elementals and undead that I hope pan out. I have so many pieces that are favorites, they’ll also be spotlighted as I paint them. There’s a lot of ground still to cover. I’ll also have some tips and tricks on how to handle your Bones, how to straighten those pesky curved swords and show how remarkably easy it is to re-base them. I cannot wait. The arrival of this box has reawakened my passion for this hobby. Reaper has done an amazing job in getting all this out (even if it is a few months past their anticipated delivery date). If they are crazy enough to ever do another Kickstarter, I will leap at the chance to pledge. This month’s group of pregenerated characters are a cult dedicated to the evil snake god Ydersius that has taken their veneration in a much different direction. As young upstart adventurers, they have discovered Ydersius’ message of immortality and have long admired the snake’s power and charm. Since worship of Ydersius is not welcomed by all in the civilized world, they have tried to keep their true identities secret and adopted serpentine nicknames for themselves. They have also taken to wearing black hoods (to emulate Ydersius’ headlessness) and green hued clothing and armor (to emulate a snake’s green body). Behind The Character Sheet : As you can see from the multiple Boon Companion feats, each character in the party will basically have a large-sized constrictor snake or medium-sized poisonous viper at 5th level. I recommend the constrictor because they will be large, have reach and can constrict. Do not forget to make them even more deadly by giving them feats such as Power Attack, Toughness, and Combat Reflexes.